So, even though working mainly with octane lately, I still upgraded to pp11, and wanted to give superfly a try. it was absurdly slow, and also made my pc lag like crazy, so I let it go...I tried to use GPU render, of course, since I have a decent GPU (1080TI). and now...by a mere mistake...I run a default test render and was shocked to see that it was a superfly render...and it run smooth and fast without lagging anything! I opened the settings and saw that it's set to CPU!!!! so...can anyone tell me what might be wrong, that cause superfly to behave so bad with a GPU that's burns renders in octane and Iray like a super-nova? @gsfcreator I run two nvdia cards. On runs the screen and the other just for rendering. Yes, if you run just one card in your machine it has to calculate your render AND redraw the screen. I don't watch videos or play video games while I'm using both cards for rendering. OTOH I can set it to use only the card that is not running my monitor and I can do whatever I want while it renders. @adp it's the extreme version of 1080TI (11GB! if that's not enough I don't know what is...). I render with Octane - which uses 100% GPU - and I can work and do stuff on my pc while it's rendering, without any problem...So there must be something wrong with how superfly is using my GPU (But i have no the slightest of ideas what...). Maybe simply a driver problem? Render in the separate process - unchecked? Sometimes something goes wrong in SF initialization process, and render starts to crawl and hog resources like mad... What helps me: change bucket size, restart Poser, restart Win. Try to render in background. Gives me more or less Octane experience, not in speed, but in other applications performance. 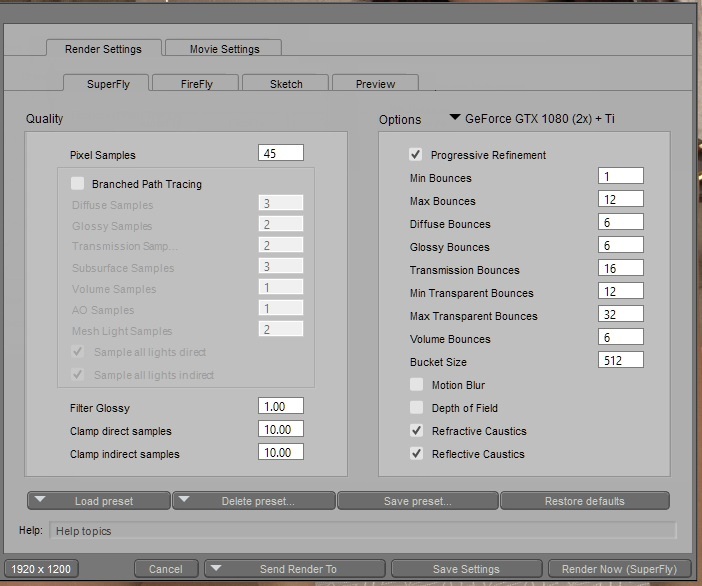 BPT mode almost always creates lags with GPU unless you set different kinds of samples to 1-2 and small bucket size. @jura11 thank you so much for this thorough replay, Jura! I'll check this one out. I'm on poser pro 11, of course (otherwise I won't be asking about GPU rendering :) ).